The first sighting I had of this creature was a luminous glowing from the middle of the road. I went and got my camera. Its a bit difficult to make a description by the light of a camera flashlight. 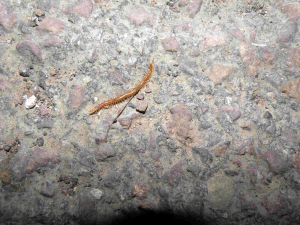 Anyway it looked rather like a centipede with lots of legs either side of a body about 2 inches long. I don't know whether it was the head or bottom that glowed but i asume it was the bottom. any ideas? picture not very clear.